How does one go from being college dean to chocolatier with a plan? If you are Romeo Garcia, 38, you simply drop everything and fast-forward to a chocolate academy in Antwerp where Belgian bonbons are handcrafted and made with respect for tradition. That’s what he did in 2014 when he stepped down as Dean of Counselling at Merritt College in San Francisco to become a full-time chocolatier. 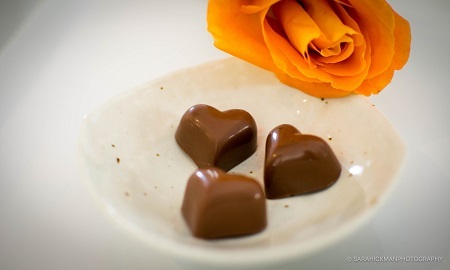 Today, Romeo Chocolates are available in select retailers, and hotels in Long Beach and through custom orders. A Kickstarter crowdfunding called “Let’s Build a Chocolate Shop” will see Romeo with his own storefront in Southern California’s competitive retail market very soon. “I have the lease, I have the key,” he said on his Kickstarter video. Born in Lipa, Batangas, Romeo came to the U.S. at age 5 to join his mother and father who had immigrated to California. He is the fourth in a family of six children. 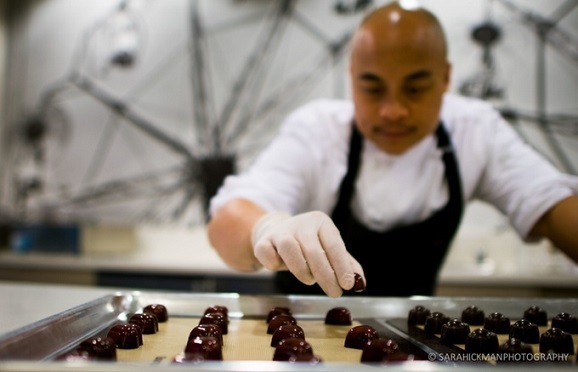 “I always associate chocolate with nostalgia,” he shared in an interview with The FilAm. By nostalgia he meant ‘balikbayan’ boxes jammed with towels and toiletries, shoes, clothing, electronic toys, and among carefully packed sundries were bags of M&Ms and Kit Kat bars. Romeo was Dean of Counselling — on track to becoming vice president — when he decided to enroll in a chocolate making class as a way to relax after work. The school sent him to Belgium for further studies. He had a choice of two other countries, Italy and Switzerland, but he chose Belgium “to learn more about fine chocolates” and deepen his knowledge of techniques. He continued his studies at the Chocolate Academy in Chicago, and also in Las Vegas at Atelier Melissa Coppel where he trained under known Chocolatier Ambassador, Chef Melissa Coppel who has won industry honors for her “chocolate artistry.” Coppel is currently associated with the Bellagio Casino in Las Vegas. Romeo Chocolates cocoa is sourced from El Salvador, Nicaragua and Honduras, North Shore Hawaii and Fair Trade Chocolates from Belgium. In the Philippines, which is also a significant cocoa producer, Romeo’s travels brought him to the Tablea Tsokolate facility in Batangas where he observed cocoa being roasted like coffee and manually ground. He noted how in provinces like Batangas, Davao and Cavite, Filipinos are creating delicious chocolate in stone-ground ‘tableya’ style, craft chocolate bars, and European-inspired bonbons. “There is an exciting craft chocolate movement in the Philippines, and they’re winning awards globally,” he said.